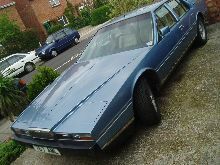 When launched at Woburn Abbey in 1976 the Aston Martin Lagonda had futuristic looks and almost space aged electronics for the time. 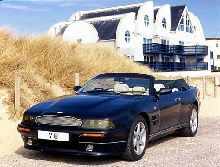 The Lagondas William Towns designed, four door, pop-up headlamp bodyshell enclosed the fuel injected 5.3 litre Aston Martin V8 engine and was capable of carrying four passengers in comfort at speeds approaching 145mph. 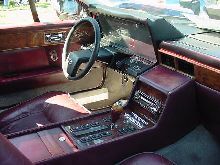 The cars electronics featured red LED displays and touch-sensitive switch gear at first, moving on thru TV monitor displays to finally a LED instrument binnacle. The cars facia also had a "talking" computer and many other "gadgets" were often fitted for individual owners. Early cars suffered from electrical problems and interestingly had fixed rear door windows! 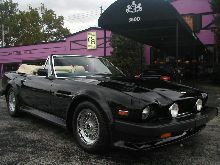 The car lasted into late 1990 in a facelifted format, many cars were exported to the overseas markets including the Middle East.